Not long after Scott and I got married, his family decided that the grown-ups would start exchanging homemade Christmas gifts. The girls would make gifts for each other, and the guys would as well. No shopping, no pressure, no stress. Sounds like a great idea, right? Except that my crafting skills peaked at the age of eight, making spray-painted Christmas trees out of old Readers' Digests in Vacation Bible School (Remember these? Well, my mom thought mine was pretty). Oh, and my mother-in-law is one of the most creative, craftsy people on the planet; my sister-in-law Holly writes the DIY blog McCall Manor and can turn furniture roadkill into works of art; and my sister-in-law Karen turns out holiday ornaments and other creative projects for which I wouldn't even know where to begin. Me? I can make cookies, so that was to be my fallback - and would certainly make me popular with our nieces and nephews. Thanksgiving approached and I still didn't have any brilliant ideas. But scrolling through Facebook one afternoon, I realized I couldn't make ornaments or decorative pillows - but I could make a photo book! So, I scoured our family's Facebook pages, tossed together a photo book on Shutterfly (I frequently do TV segments on their behalf) - and dubbed it the "Sewell Family Yearbook." Voila! Everyone loved it - although I did still bake dozens of Christmas cookies and carry them with us to Tennessee…just in case. The first book was a small softcover book with 70 photos. The project has since taken on a life of its own, evolving into an 8 x 11 hardcover book the following year and growing in size and scope each year. The book now regularly tops 100 pages with 300 to 400 photos. I actually start working on each year's book right after Christmas, and then gather photos from family throughout the year. If they don’t send them, I scour Facebook and Instagram for photos that other people post of them. Shutterfly makes it easy to create the book; while I prefer to design my own, they also have easy templates to follow (and an easy-to-use mobile app). Once we have the photos together, we finalize the book, order six copies - and our holiday shopping is done! The best part of this process? Sitting around the table at Christmas, paging through the books and sharing memories of the last year…all while nibbling on those cookies that I still bake and carry home with us every Christmas. If you’re trying to come up with a gift that won’t get returned, why not personalize your holiday gifts? Here are a few ideas I am sharing for several companies on my holiday TV tour. (The final one is the gift my husband and I give to everyone in his family!). To frame a special photo or piece of art, Art.com does custom framing by mail for a fraction of what it costs in a framing shop. To use their new service called Frame Your Art, first browse their large selection of frame styles and mats. You can even upload a photo to see exactly how your art will look in the frame you choose! They will then send you pre-paid packaging, which you use to ship in your art. I love this idea, because you can frame photos, prints, diplomas, children’s art projects or any other art you want to display. Prices range from $59 to $189, depending on frame style and size – and you get free shipping both ways! Just make sure to send your art back by December 11 to get everything in time for the holidays. Rag dolls are a classic Christmas gift, and I love the Christmas Rag Dolls from Personal Creations. Not only can you have them personalized with a name, but you can give a doll that looks just like her! Choose from Hispanic, African-American or Caucasian dolls, and the Caucasian dolls have either blonde, brunette or red hair. Wine lovers will enjoy a bottle of Josh Cellars Cabernet Sauvignon, Merlot or Chardonnay customized especially for them. Buy the wine locally, and then create a free custom label on their web site that is designed especially to fit the Josh Cellars bottle. Order by December 13 to receive it in time for Christmas. Photo books are special gifts that will be appreciated for years. 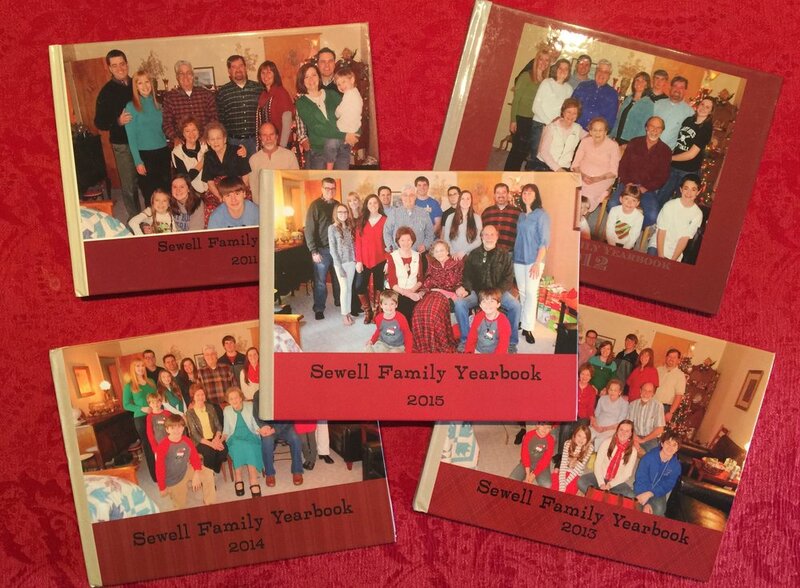 Each Christmas, we “surprise” my husband’s family with what is known as the Sewell Family Yearbook, a photo book featuring hundreds of family photos from the previous 12 months. Throughout the year, I collect pictures from family, and organize them into a photo book on Shutterfly. It’s a great way to get pictures out of the computer and out where people can actually enjoy them. The best part? Sitting around the tree at Christmas, paging through the books and sharing memories of the last year. * Photos courtesy of Personal Creations, Art.com, Josh Cellars, and Shutterfly.